I participated the journey to the primeval ground of Helleborus in Czch　Republic, Hungary and Croatia prepared by Japan Christmas Rose Society with about thirty members. This journey was specially arranged by the society and guided by Mr. Will Mclewin himself who is a very famous person among us. The primeval grounds of Helleborus were not in the deep forest but generally near the village people live and in the edge of the deciduous forest mostly made of oak trees. The first place we visited was in Croatia where the deciduous forest extends to the edge of the village in north Croatia. We could see the ‘H.croaticus’ scattered between the carpets of the fallen leaf on the woods . In the same place we could see ‘Erythronium’, ‘Primula’ ,’Plmonaria’ etc. It looked like a festival in the spring ephemeral. It looked so beautiful. 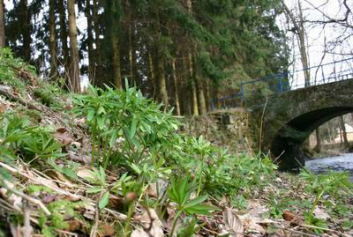 Next place we visit, there were so many ‘ H.dumetorum’ in the village near the stream　with‘Galanthus’. Each piece isn’t big. Next day we went to the deciduous forest in the national park near Pecs, Hungary. 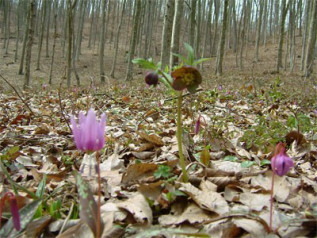 At that place we could find ‘H.odorus’ with many ‘Hepatica’, colored peal blue. We know ‘H.odorus’ has fragrance, but all of them have not it. We don’t know the reason why some of them has fragrance and some of them has not. One more place we visited to see ‘H.dumetorum’. These places were not so in the distance, but the species were not mixed. We found the difference between here in Europe and Japan. We could see so many Helleborus with spring ephemeral there, but in Japan we could not see it where nearly the same situation. Hepatica was only one color and bigger than Japanese one. Erythronium there was similar size, color and shape in Japan. When this original seed was planted in the deciduous forest of Japan, was able to exist and was the same spectacle seen? The natural ecosystem is mysterious. It is necessary to think by all means of making this spectacle of becoming of the destruction of a natural ecosystem. What happy things children in such a wonderful nature are of children who grew up ! This wonderful scene burned itself into my memory. The Helleborus is called ‘Cccria’ in Croatia. In the Majarl word of Hungary, it seems to be called ‘Fnyorl’. I’ve heard from local children. This journey was able to taste not only the round on the primeval ground but also the town in Budapest, in Prague that was World Heritage and Calrodibari, Hungary .